Holds Lectures for Heterogenic audience that includes Doctors, Nutritionists and for the open public. Gives Nutritional and Sport Guidance for the individual. Writes and advertises professional articles for the media. Serves as "Harduf - Company for Organic Food" Adviser. 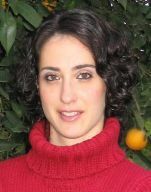 A member of "A.T.I.D" - the Israeli Dietitian Association. Certified Clinical Dietitian, B.Sc Graduate of the 'School of Nutritional Sciences' at the Hebrew University of Jerusalem. Qualified Health and fitness Trainer, encompassing advanced studies in Youth and Children. Graduate of the the 'Nat Holman School for Coaches and Trainers', Wingate Institute. Works as a Clinical Dietitian at 'Schneider Hospital' - Children's Medical Center of Israel. Certified Support Groups Mentor for Wise Nutritional Habits and Weight loss of the 'Bob Shapel School of Social Work', Tel Aviv University.